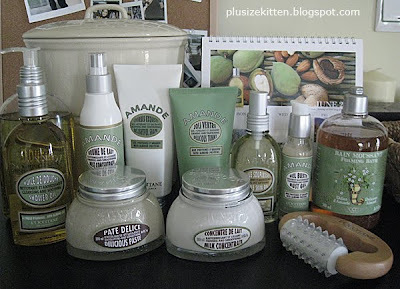 Here's a photo of my Loccitane Delicious Almond haul (complete body care range) under the requests of my readers itching to see whether I was joking! In the picture - limited edition 500ml Almond Shower Oil, Almond Shower Oil 250ml, Limited Edition Almond Concentrate Mist 200ml (not available in Msia), Delicious Tummy 150ml, Delicious Shape 100ml, Almond Supple Oil 100ml, Almond Bust Gel 50ml, Almond Bath Shower 500ml, Almond Milk, Concentrate 200ml, Almond Paste 200ml and Loccitane Slimming Massager RM28 (I also have the limited edition Almond shower oil 75ml and Almond Candle flying in from Canada this month). 1. It smells HEAVENLY like yummy almonds. 3. It firms, moisturized and tones your body yum! Especially the scrub, it's so so so yummy. I used it last week and fallen for it on first lust. The scrub is gentle and almost cream-mud like when apply on your skin. The almond scent moans to you and you cant help but caress it more. You dig deeper and more into the paste jar wishing you could smother all of it on your body (but stop after remembering how much you paid for this jar). Just when you though you're on an almond high, a chain of effect sets off when you shower. 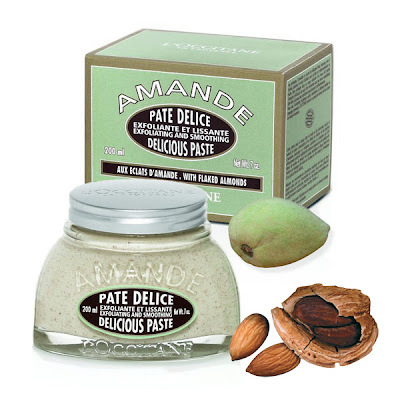 The almond paste turns to milky, watery water and moisturised your body. Oh I can't go on... anymore. I have officially made love to a almond scrub. omg i'm using the scrub too!you're right..it's orgasmic! LOLz..even eating almonds doesnt feel this good.. omg!!! you got that right too! eating almonds don't feel this good too lol!!! wahaaaaaa i so jealous...i dun wish more got one almond range product also enuf already....!!! Lisa: Valentine's Day coming! must hint hint hubby dearest kekeke..
wahh actually the almond paste is not in my list, i only thought of buyin almond milk concentrate haha which one i should go first?? Iced Nyior: They're lovely but pricey T_T agree with you. I like to eat almond, but I never try to apply it on body/face, how is it?? u smash it into bits.. mix with creamy butter and milk... and apply on your body... the smell is intoxicating..